On both sides of the car it looks normal, but you can spin on top of the wheel arches and guns appear. Front of car is a screwdriver like piece, which extends when pulled out. Great car, very solid, doesn't break easy. I aim to respond within a few hours to all requests. 2 used ones, one is slightly smaller ( unsure if it's Hotwheels, dated 1995, slightly 'chewed' rear spoiler ). 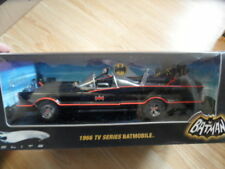 Corgi bat man collectible editions 1:43rd scale die-cast vehicles includes 1940s batmobiles, 1950s jokermobile, 1960s batmobiles, 1960s batmarine, 1980s batmobile, 1990s batmobile, 2000 batmobile, 2000 batmobile. Comes in and unopened box with a few few marks on the box . BY TM & DC COMICS. IN DISPLAY CASE. A Hot Wheels SPIDER-MAN diecast model of the SPIDER-MAN ROCKSTER. MARVEL SPIDER-MAN. HOT WHEELS. Character Family Spider-Man. condition is mint to near mint condition (never opened). Year of Release 2014. Scale 1:64. MAXIMUM DESTRUCTION. MONSTER JAM. SPIDER MAN. Series Monster Jam. 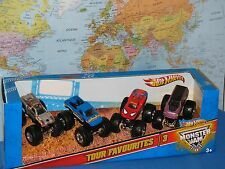 Model Monster Jam. TOUR FAVORITES #3. Vehicle Type Monster Truck. Custom Bundle No. ARMORED BATMAN & MAN OF STEEL. Hot Wheels 2015. Batman v Superman featured in the movie. 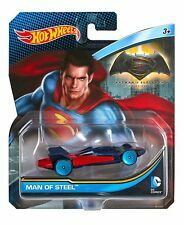 HOT WHEELS HWDKJ79 MAN OF STEEL CAR BATMAN V SUPERMAN" DC COMICS 1:64 DIE CAST"
HOT WHEELS BATMAN V SUPERMAN MAN OF STEEL CAR HWDKJ79 "DC COMICS 1:64 DIE CAST". MPN HWDKJ79. 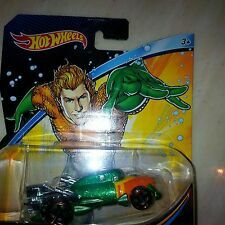 Producer/MANUFATCURER: < span class = "notranslate" > Hot Wheels. Original Scale Model (in new conditions mint boxed). The Cards Have Pictures of the marvel hero or villain Featured to the Vehicles!C ondition is mint to near mint condition (never opened). BATMAN V SUPERMAN: DAWN OF JUSTICE. MAN OF STEEL - Superman. DC Universe. We reply to all Enquires. PRODUTTORE/MANUFATCURER: Hot Wheels. Original Scale Model (in new conditions mint boxed).